When I was a little girl, I remember my mother sitting on the side of my bed in the evening and telling me stories about Giant tortoises and scaly iguanas living thousands of miles away in a place that seemed straight out of a storybook. As I grew and began studying Darwin in school, my fascination was fueled and I knew I had to see the Galapagos for myself! As I started my research into our Galapagos adventure, I was hoping to experience timeless beauty in natural solitude, but in the end, we decided to take a cruise! Why? Well, besides that the best Galapagos cruises offer a perfect mix of adventure and comfort, the main reason was that you’re not permitted to venture on the Galapagos islands alone as a tourist! The islands have strict limits of how many tourists can enter each day, and you must come with a guide. A cruise is a great way to get the most out of the islands without having to worry about these hang-ups. With arms twice the size of their face and claws that are undeniably prehistoric, the Giant tourtises were fascinating! Now it came time to choose the right cruise for us. Chris and I talked about what we wanted to do, and in the end, we came up with our priorities: wildlife and snorkeling. After a bit of searching, I came across Quasar Expeditions. They offered an 8-day itinerary that took us to the heart of the habitats of incredible creatures and featured daily snorkeling excursions. Everything was included except alcohol, and Quasar took care of all the regulations imposed by the island authorities, so all we had to do was enjoy and explore. Our Yacht had about 16 cabins, so when I say cruise I’m definitely not talking about one of those giant cruise ships! Although the Yacht seemed small for 32 guests and staff (including two naturalist guides), it never felt crowded. We always had ample space to relax and enjoy our down time. The food and service were also excellent, which is important because we had all our meals on board. 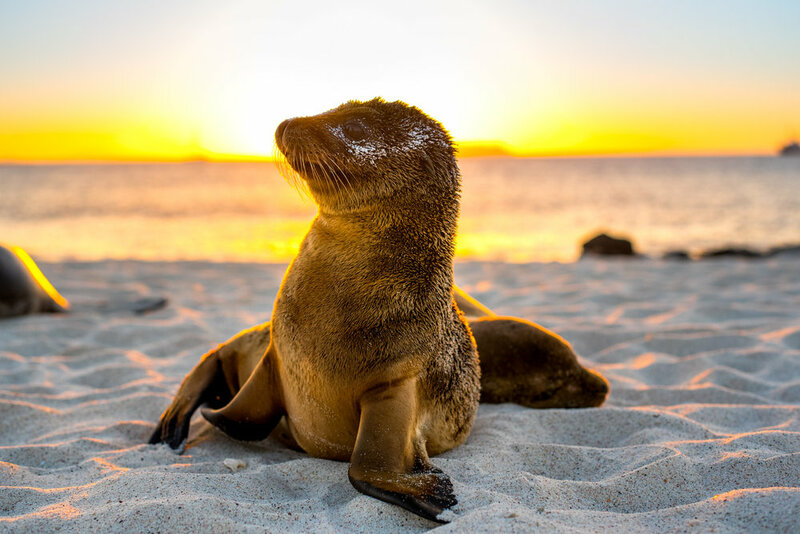 Finding the best Galapagos cruise for you is essential to maximizing your experience on the islands, that have enchanted the world for centuries. Finding a cruise with plenty of excursions with opportunities to see as much wildlife as possible, was our top priority! The Evolution, part of Quasar Expeditions gave us this. Our room was cleaned every day as we enjoyed what the ship had to offer, such as multiple lounging and sunbathing decks, a boutique, an outdoor Jacuzzi, and a saloon. My favorite part of the ship was the outdoor bar on the upper deck. After a day full of action, it was the perfect place to enjoy a glass of wine as the sweet and salty sea air settled down and the sun fell, hazy pink below the horizon. The ship is staffed with a full, experienced crew, and there is an infirmary on board, so any doubts about safety were quickly put to rest. Apart from the comfortable and elegant design, the Evolution also featured excellent entertainment and fine dining. Buffet style breakfast and lunch ensured we got all the fuel we needed for days on the islands. I loved picking from the abundant, cool tropical fruits and taking in the day in the outdoor lounge. Dinner was served in ample portions and was always delicious, home-style cooking. The staff is able to accommodate for guests with allergies. In the evening before dinner, we were briefed on the upcoming excursions and given interesting lectures that made our next day’s experiences more fulfilling. The naturalists were never boring and were always willing to answer all of our questions. After dinner, we were free to roam and socialize, but we were usually so tired that would just watch a movie and crash in our suite! The Evolution was excellent, but what we really came for were the excursions and to photograph some beautiful wildlife. The 8-day cruise featured fourteen excursions to various islands ranging from snorkeling to hiking and got us as close as possible to the wildlife the Galapagos is known for. Everything was pre-planned, so there were no unexpected surprises. We got to go snorkeling almost every day, and had some other unforgettable experiences like swimming with sea lions, sunbathing on green and red sand beaches, visiting volcanic craters, and watching Boobies do their mating dance! Here’s a quick, day-by-day look at our trip and more of our Galapagos excursions! Watching one of the Alpha males make his way to his harem! Galapagos is a bit hard to get to, so we spent the night prior in Guayaquil, a port town on the coast of Ecuador, so we wouldn't feel rushed. When we arrived at the airport to fly to Galapagos, we met with a member from the Quasar team, who breezed us past security and made sure we had all our documents in line - such a great convenience! Our plane arrived to San Cristóbal Island at the capital of the Galapagos, Puerto Alfredo Baquerizo Moreno, a fascinating town of only 7,000 inhabitants, and we boarded the Evolution. We were briefed on the wildlife and Galapagos park rules and then headed to our first excursion on Isla Lobos! We landed on a coral sand beach and got to see our first sea lions and have a refreshing swim! Everyday we would see groups of playful seals, welcoming us...and no this wasn't taking with a zoom lens, you really do get this close! Our first day and I was surrounded by seals! We took a panga boat (otherwise known as a dingy) out to South Plaza Island for an easy hike and to get a glimpse of their brightly colored Land iguanas! And at the end of the hike? Our first time snorkeling on the Galapagos! After lunch, we made a wet landing on the white-sand Mosquera beach, which has one of the largest sea lion populations. The Land iguanas were stunning! They were all different variations of yellow, green and teal! We went to the famous “Chinese Hat” islet; a tiny island that looks just like a traditional Chinese hat due to a volcanic crater at its center. We saw penguins, blue-footed boobies, and incredible lava flows before snorkeling in the pristine waters between the islands. Next, we went to Darwin’s favorite spot, James Bay. We took a nice hike and saw the rare Galapagos fur seals! The Evolution anchored inside an ancient volcanic crater and we made a wet landing on the island of Genovesa, home to over a million seabirds. We hiked to a red-footed booby colony and then went swimming with sharks! They aren’t dangerous, but it was still scary! After lunch, we went hiking to a serene plateau and explored the Palo Santo Forest, where we even saw a short-eared owl! The red footed boobie! They were such sweet and fun birds to watch! You have to always keep your eyes open in the Galapagos, because you never know when a short-eared owl is going to be right next to you! We started on North Seymour Island, known for its large frigate bird colonies. We hiked up a rocky trail and then dove into the deep blue sea for more snorkeling. This time with rays and sharks! I was getting a little more used to these guys! Next, we headed to Santa Fe Island for a hike through the giant cactus forest, home to iguanas and Galapagos hawks. A male frigate bird who has inflated his throat patch to make himself more presentable to the ladies...it was breeding seasons during our visit! On day six we went to the post office. Not so interesting? Think again! The 18th-century post office on Floreana Island is no more than a wooden barrel on a post. Visitors still put letters in the old-fashioned way: without postage. New visitors come and sift through the letters, trying to find some they can deliver by hand. In the afternoon we found ourselves at Punta Cormorant where we dug our toes into green-sand beaches and kept a lookout for flamingoes at the Brackish Water Lagoon! We made port at Puerto Ayora, the economic capital of the Galapagos and also the home of the Darwin Research Center. We hiked through an incredible forest and made a stop to visit the famed Giant tortoises! A dream come true! We spent the rest of the day exploring Puerto Ayora and the local culture, including the Darwin Research Center. We wish we could stay here forever! A sad day, indeed! We took one more panga boat ride out to Black Turtle Cove and waved goodbye to our new friends: sharks, rays, turtles, and pelicans all passed us by as if wishing us a fond farewell. After breakfast, we landed and it was time to leave the Evolution. All the staff and our fellow passengers had become like family. We said goodbye with heavy hearts but left with unforgettable memories of the enchanting Galapagos. One of the main reasons for wanting to visit the Galapagos was to see the sea-life! We wanted to get as much swim time as possible and see all the unique creatures that call these islands home. During our trip with Quasar, we were able to go snorkeling at least once a day and saw everything from hammerhead sharks, penguins and even danced around with seals! Here are the highlights! Quasar, a family owned business, delivered a truly magical Galapagos experience that was worth every penny. Whether you’re into lounging on sun-drenched decks or diving into the heart of adventure, Quasar has got you covered. We would highly recommend this company as they put all our worries to rest and showed us the best of the Galapagos, along with its unseen nooks and crannies. Quasar has been cruising the Galapagos since 1986 and is devoted to providing luxury to its guests while honoring the natural wonder of the islands. Quasar takes special care to make sure their services don’t interfere with native flora and fauna, and they even contribute to conservation projects, making them the best Galapagos cruise for our money. Traveling with Quasar made our cruise feel like a true expedition to an unseen land, and we were thrilled to find out that they also offer excursions through Patagonia. We hope to be exploring with them again soon! Ever since I sat on my bed as a wide-eyed little girl, head filled with tales of basking iguanas and ancient forests, I knew that seeing the Galapagos would be an incredible journey, but I could never have imagined how much this adventure would touch our hearts. Looking into the cracks of the earth and seeing the diverse life and beauty that springs from within gave us a new appreciation for conservation and a better understanding of our home on planet Earth. 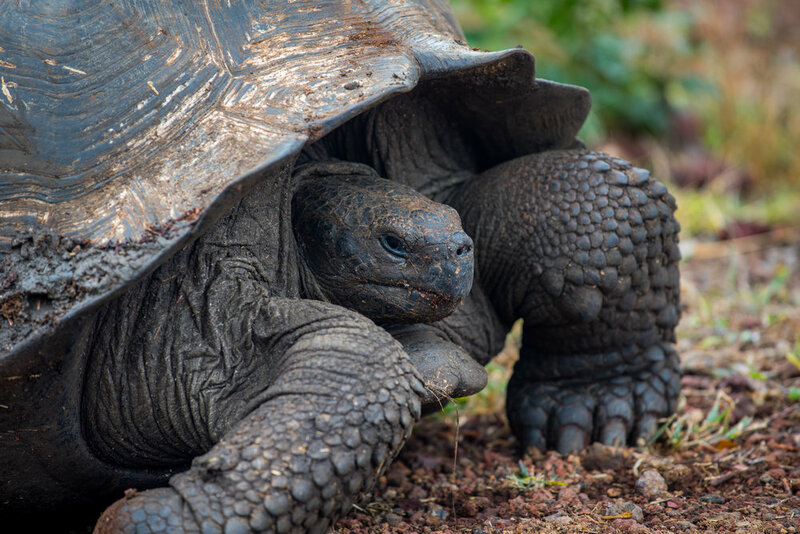 Visiting the Galapagos was a genuinely life-changing experience, and its effect on us.... will only be outlasted by the wry smiles of the wise tortoises watching generations pass by.